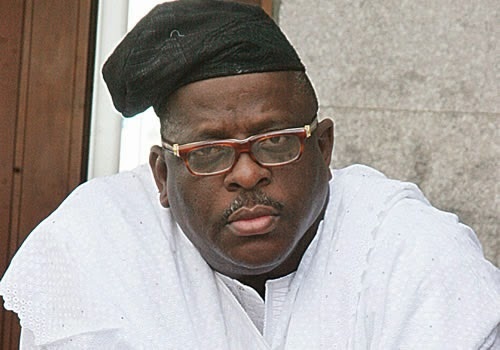 The news says that Buruji Kashamu, a senator-elect in the just concluded election in the country has been put under house arrest in Lagos, by the National Drug Law Enforcement Agency, NDLEA, for the second day and that he may appear in court on Monday. Available information says he has been put under house arrest, because the United States of America, where he is said to be wanted for drug related offenses has asked for his extradition. But for many people who have been following events in Nigeria, they say there may be more in the Buruji's current travail than meets the eye, and that it may be a case of one powerful General throwing his weight around. It is true that America said Buruji is wanted to answer a case in the US based on Olusegun Obasanj's accusation and Buruji's confirmation that the case case has been running for a long time and that he has been cleared by a court in London. He said he has no more case to answer in the US. Obasanjo had rejected Buruji as his party leader in Ogun State, because of Buruji's drug offense in the US. The manner of the sudden extradition request from the US and the subterranean manner with which the NDLEA is reported to have gone to get Buruji without a search warrant is enough to link Buruji's current problem to some powers in Nigeria who want him down and out. And this cannot be unconnected to the political power game in Nigeria. Buruji was locked in a battle of power supremacy in Ogun State against Obasanjo and it was one of the reasons Obasanjo advanced for the withdrawal of his support for Goodluck Jonathan. Obasanjo had said publicly that he cannot be under the leadership of a man wanted for drug offenses in the US and he had asked Jonathan to forget about his support for reelection if Buruji remained the PDP's leader in Ogun State. Jonathan stuck to his choice of Buruji as leader of PDP in the state to Obasanjo's chagrin and Jonathan and paid the price. He lost Obasanjo's support and led to Obasanjo decision to ask someone to publicly shred his PDP's membership card. The election is over. Buruji has won a senatorial seat. But the battle for supremacy is not over. The power that wants Buruji down and out has not finished work. The irony here is that the same power that wanted Buruji's head had been Buruji's acolyte before the association between them fell apart. Buruji had said that he was a close political associate of the former General and that the General had benefitted from their association before they fell apart. If General Obasanjo had dished Jonathan over Jonathan's choice to have Buruji as PDP's leader in Ogun State, how did Buruji think he could become a senator in Ogun State with Obasanjo alive and survive? I don't know the cause of the disagreement between Obasanjo and Buruji. No one may know other than the two of them. It is what either of them tells people that people will know. They say they had formerly been friends before they became enemies. It is difficult to ascertain the truth or otherwise whether some powers are behind the extradition request from the US and the NDLEA's decision to expedite the extradition request without a search warrant. But the information from newspaper reports that Bode George's wife is the director General at the NDLEA and that she may be behind NDLEA's expediting of the extradition request may be considered. But to be able to tie her to the subterranean mode of NDLEA's operation against Buruji, there will be need to know who appointed her to her post? Many people believe that the mistake Buruji had made was that once he knew about his own past, he could have gone low and not ever contemplate seeking elective position or leadership position in any way. He knows the case he has in America and London. He had said that the court 's judgement in London has exonerated him based on his opinion and understanding of the law, and said the US law enforcement think otherwise. When the going was good between Obasanjo and Buruji, no one knew about Buruji and his US drug case. But some people are asking whether as a senator-elect Buruji is not covered by immunity, and that why has the US not seek extradition before his election as a senator? Some people say the power against Buruji has ensured he does not get sworn-in and be under immunity before he is slide tackled. And it seems the power - in the person of Nigeria's three times head of state - has got Buruji, judging by most of the comments that follow news reports on this issue.